[SatNews] Thrane & Thrane provided an EXPLORER 325, to handle the communications during a 'green' expedition in which two electric Nissan Qashquais are driven around the world. The 'Charge to Change Electric Expedition', which set off from Copenhagen on Friday, July 25th is the brainchild of married Danish writer and explorer couple Hjalte Tin & Nina Rasmussen, who plan to complete the 36,000km course in just 10 months. Charge to Change will be the first round the world journey using standard electric cars. The team will drive a gruelling route, while meeting experts and communities, in order to show the world that electric cars are a viable, cleaner form of transport. Already authors of 12 books, stars of a TV series about their travels and famous for designing and building an innovative low energy house in Denmark, the couple's high-profile is important for insuring the support and coverage that the expedition needs to be a success. 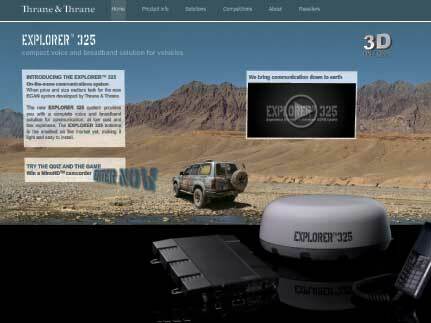 As indeed is the EXPLORER 325, which will enable followers to watch the team and get updates regardless of where they are in the world. The Thrane & Thrane EXPLORER 325 uses the Inmarsat BGAN service to offer data speeds up to 384kbps standard IP and up to 128kbps streaming, and works down to 5° elevation whether stationary or moving at speed across all types of terrain. It provides global voice coverage and Internet access and is suitable for a wealth of applications and user segments from government and military through to NGO, humanitarian and field service use. Its introduction in March 2010 and subsequent first delivery in July 2010 opened up a new low price-point, making cost-effective on-the-move communications a possibility for a wider range of applications, including trains, buses, trucks and sporting events such as cycling or motorsport. Hjalte Tin is no stranger to satcoms and in particular Thrane & Thrane's EXPLORER terminals, having used them while leading motorbike tours all-over the world with daughter Ida, for the family's bike tour company, Moto Mundo: "The route will take us through some very remote areas and over some rough terrain, so based on my previous experience of the robustness and reliability of EXPLORER products, I am delighted to be using them again," says Hjalte. "We will have global voice communication and broadband internet via satellite, wherever we are, and even when the cars are moving. EXPLORER 325 will be used to deliver photos and footage, to maintain our blog and to talk to and e-mail friends and family." The Charge to Change Expedition will travel 36,000 km in sixteen 2-week stages, with the cars completing 200-300 km over 4-5 hours of driving per day. The first stage of the route ended in Moscow at the beginning of August. After Moscow the team started the long journey east and is currently driving through Mongolia. The plan is to reach Shanghai in October, where the cars and the team will play an important role in the Danish pavilion at EXPO 2010. After this, the route crosses the USA from West to East before rising up through Europe to the finish line in Copenhagen on 1st May 2011. The expedition can be followed on the www.explorer325.com website . "We are delighted to be part of this important expedition as it has the potential to promote a much greener form of transport to the world," comments Morten Rishøj, Market Development Manager at Thrane & Thrane. "EXPLORER 325 is the ideal solution for the team and has already proven it's worth. Hjalte and Nina are able to keep in touch via voice and the internet while the cars are moving even in the most remote areas such as Siberia. At just 35cm in diameter and 13cm high, EXPLORER 325 features the smallest available vehicular BGAN antenna on the market so its size and weight will ensure minimal drain on the car's battery, helping the team to make better progress between charges. We are excited to play a part in Charge to Change and wish Hjalte and Nina the best of luck for their travels."